Contemplating a cycling holiday with Mulga Bicycle Tours? You’ll be in good hands with Denise and Mark Arundel, self-proclaimed cycling fanatics with over 30 years’ cycle touring experience. It’s all about the finer details for these two. They’ve planned every inch of every Mulga tour themselves, and they like nothing better than sharing the road – and their stories – with their fellow travellers. Denise and Mark know a thing or two about the joys of bike touring. Together they’ve cycled through nearly every corner of Australia, carrying all their creature comforts, water, food, and camping gear in two trailers and on their bikes. Their extensive travels even include a year-long, unsupported trip around Australia in 2009, where they rode nearly 18,000 kilometres in 364 days. The pair visited each state capital city and made countless memories along the way, many of them captured in Mark’s professional photographs and shared on their blog, Sprung Chicken Ride. 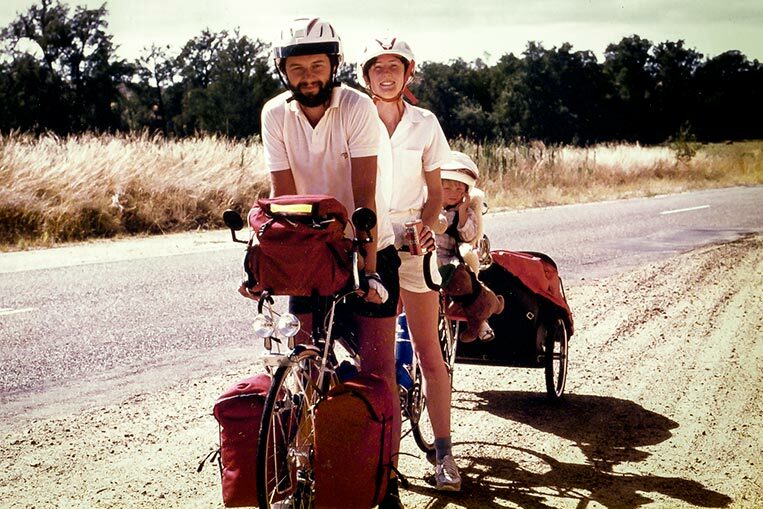 Denise and Mark and daughter Rebecca with Teddy on their custom-built tandem (made in Canberra by Spokesman Cycles) in 1985 on the Princes Highway near Bega in rural NSW. The bike is equipped with a Cannondale trailer imported from the US (before the internet made it easy), and home-made panniers and handlebar bag. During their years of touring, Denise and Mark learned the joys of travelling slowly, of memorable encounters with the landscape and people, and particularly of sharing their experiences – the hardships and achievements – with others. After many years of research, riding, and planning, their passion for touring has been combined with their business expertise to create Mulga Bicycle Tours. Denise and Mark believe cycling is the ideal way to restore balance in our busy lives, to see the world at the perfect pace, to engage the senses, to meet interesting and friendly people, and to find fascinating stories to tell. “To us,” says Mark, “the bike ride is just how we choose to travel and is secondary to the pleasure of discovery”. Join Mark and Denise on their next journey of discovery. Find out more about their upcoming bike tours.